Just as I warned back in January, the race to blame the Great War on the Evil-Serbs-and-Russians (properly pronounced in the same breath) is on. In the New York Times' Sunday Book Review, Reuters editor Harold Evans gave a glowing review to Christopher Clark's "The Sleepwalkers", which blames Serbia for "expansionism" and "terrorism," and Russia for "creating a narrative to justify taking up arms", by "shift[ing] the moral onus from the perpetrator to the victim." Naive France and gullible Britain got suckered in, and thus the Great War began. This is, of course, patent nonsense. The French wanted a war of revenge for 1871, and this seemed as good an occasion as any. Britain chose to go to war, and while Sir Edward Grey couldn't imagine the actual horrors the war unleashed, his famous comment about the "lamps going out all over Europe" more than suggests he was aware something horrible was about to happen. Does that sound like being suckered in by the wicked, wily Russians to you? Barbara Tuchman began her "Guns of August" with the parade of European royalty at the 1910 funeral of Edward VII of England - "on history’s clock it was sunset, and the sun of the old world was setting in a dying blaze of splendor never to be seen again." "King Alexandar and Queen Draga, betrayed and defenseless, huddle in a tiny closet where the maid irons the queen’s clothes. They are butchered, riddled with bullets, stabbed with a bayonet, hacked with an ax and partially disemboweled, their ­faces mutilated beyond recognition and the bloody half-naked remnants tossed from the royal balcony onto the grounds." 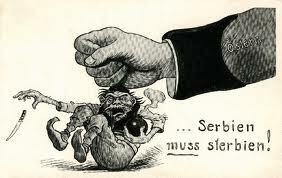 Those horrible Serbs, murdering their defenseless king that way! Such savages! Let's set aside the inconvenient fact that the squeamish Brits were busy at the time setting up concentration camps for Boer civilians. Clark doesn't explain why the Obrenovic king was killed, as such hatefacts would interfere with his precious narrative. So the reader doesn't get to understand the heavy-handed absolutism of the Obrenovics, their servitude to Austria at the expense of their country and people, and the long string of abuses and humiliations heaped on both the ordinary Serbs and the military. His marriage to Draga Masin, a rich merchant's divorced daughter who went so far as to invent a pregnancy to appear likeable, was just the last straw. While I can't in good conscience approve of the method of their dispatch, they well deserved to be overthrown. But Clark needs to show that Colonel Dragutin Dimitrijevic "Apis" was an evil, murderous conspirator who deliberately started WW1 out of his Serb nefariousness, so the context of the May Coup, Austria's abusive relationship with Serbia, and just about everything relevant to the situation gets shoved aside. He does, however, cite "historians of gender" to argue that all of the politicians involved were men, and had masculinity issues. Such depth of analysis! Lest he be considered insufficiently postmodern, Clark also deems Austria's ultimatum to Serbia - long considered a standard of shamelessness and bad faith - as “a great deal milder” than the 1999 NATO ultimatum to Serbia. Considering that Rambouillet was patterned after the Austrian ultimatum, and that its purpose was to make the war inevitable, I'd say Clark missed the point by such a wide margin here, he ended up shooting himself. This is technically supposed to be a review of two books, Clark's and Sean McMeekin's "July 1914", but Evans spends most of his time on Clark. I get the impression McMeekin was brought along to make the case against Russia. He had previously written a book called “The Russian Origins of the First World War,” and Evans relies on him to make the claim that "Russia’s crime was first in escalating a local quarrel by encouraging Serbia to stand up to Austria-Hungary and then accelerating the rush to war." So, if only Austria had been given a carte blanche by the rest of Europe - as it had by Germany - to curb-stomp the "terrorist, expansionist" Serbian savages, there would have been no WW1 - and perhaps Britain would still bestride the world. What a load of hummus. I can understand the lament over world empire lost. I can understand the desire to blame the perennial Other - the Orthodox Slavs - for the myriad of sins of the Catholic and Protestant West. 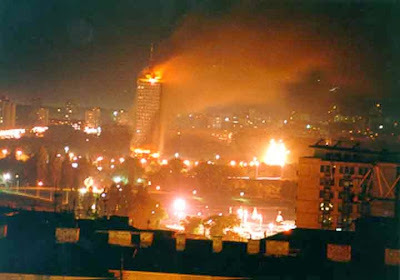 I even understand the twisted projection of conjured present - with Serbs as the arch-villains the white-knighting humanitarian West needs to defeat to save the Muslim damsel in distress and win her affections - to a traumatic event a century prior; in both cases, facts are discarded or suppressed when they interfere with the narrative. But when the modern Anglo-American historians and politicians end up sounding like Kaiser Wilhelm - whom Clark cites at one point as saying, "Stop this nonsense! It was high time a clean sweep was made of the Serbs,” - then one can only conclude they represent a civilization that has deeply lost its way. In Misha Glenny's book,he mentions a particular Austrian statesman (his name escapes me) who in the 1900s is described as being obsessed with destroying the Serbian Kingdom and annexing it into the empire. As a side note, the Austrian nationalist FPO party has been one of the EU political parties that has actually been sticking up for Serbia while calling out the EU naked bias for the Albanians! I guess its to counter the actions of an Austrian Green Party MEP who is an out right lobbyist for the KLA, but it would seem that even the Austrian right has made its peace and no longer holds a grudge against the Serbs while the so called 'liberals' of Europe still very much do. Why did the Americans sign an agreement for Trepca with the government in Belgrade instead of Pristina?